The following is a list of all the Bates Color Cards that are currently known. If anyone is able to add to this list, please submit a photocopy of the front and back to the Hawaii Postcard Club (the address is on the home page). Bates was a Honolulu-based publisher from the 1930's and 1940's and the postcards were printed in Hawaii. 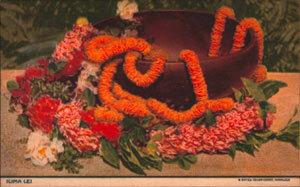 Bates Color Cards are very distinctive from all the other Hawaiian postcards that were published, in that the backs were printed with a unique basket weave pattern in color (like the postcard on the left). The small image at top middle left which looks like a water stain, is in fact, upon closer inspection, a basket with leis spilling out of it. Thanks to Leon and Dolores Rowe for their help with this list. There also exists foldout multi-postcards with the above designs on. Alphabetical list of 3-letter codes of Hawaii Picture Postcard Publishers.